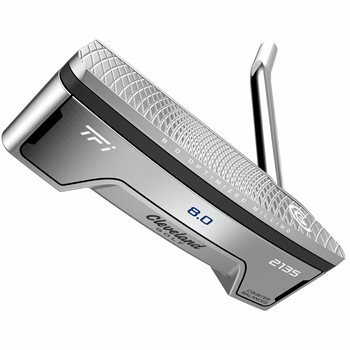 The Cleveland TFi 2135 Satin putters bring revolutionary feel, performance, and alignment technologies for easy setup and more consistent putts. Model-specific optimized face milling provides more consistent speed even when struck toward the heel or toe for more forgiveness on mishits and the Polymer TPU Insert dampens vibration and enhance feel for one of the softest feeling putters on the market. 2135 Alignment Technology raises the sightline and features a higher contrasting white sightline on a black background for better focus and easier alignment every time. The TFi 2135 Satin 8.0 has a counterbalanced blade with single bend heel.